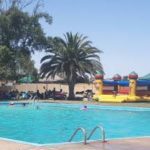 News of the drowning of the 17-year-old Jackson Iipinge at a swimming pool at a camping resort on the plots in the Swakop River near Swakopmund sent shock waves through the community of Walvis Bay. According to Detective Chief Inspector Daniel Gurirab, Acting Erongo Regional Crime Investigations Coordinator, circumstances that led to the tragedy are currently under investigation and that the incident occurred on Friday at the Moonlight Resort near Nonidas. The body of the deceased young man was taken to Swakopmund State Hospital where the doctor on duty issued a death certificate. Iipinge’s body was taken to Police Morgue at Walvis Bay for a post mortem examination.